When it comes to database load testing, in the majority of cases it’s enough just to execute a request or series of requests and measure the execution time. However, there may be some cases when you will need to access the query result, such as for building the following query, or when you use data from a database for load test parametrization instead of the CSV Data Set Config. The post will look at how to conduct such database load testing, using JDBC Sampler results. 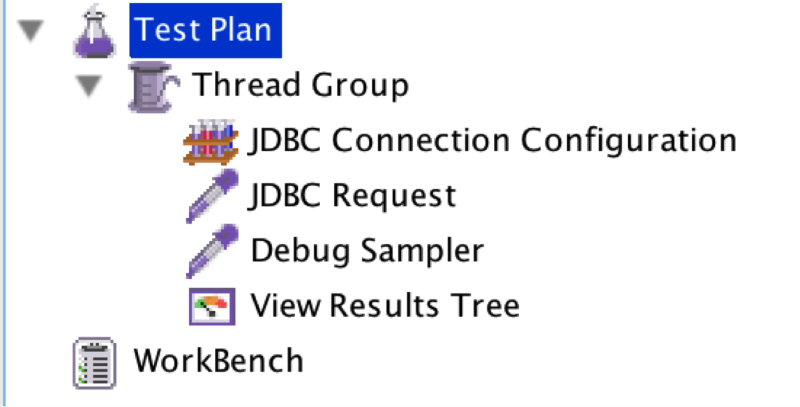 NOTE: This article assumes that you already are familiar with The Real Secret to Building a Database Test Plan With JMeter, and it is not a problem for you to download an appropriate JDBC driver for the database, put it into a JMeter classpath, and configure database connection details and credentials. This guide is more advanced and it focuses on working with your SQL query results. The result of an SQL query is presented in a table so the usual correlation with the Regular Expression Extractor won’t be that easy. 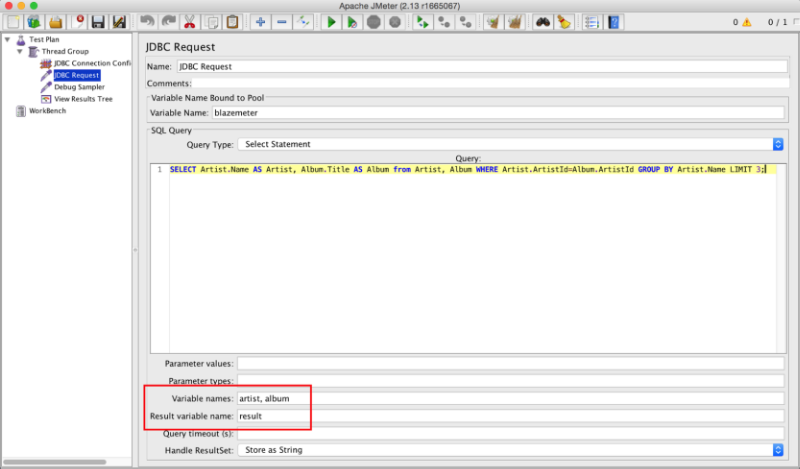 Let’s examine what an JDBC query results look like and how they can be accessed in a JMeter test. All SQL queries in this article are made against Chinook Database version 1.4, which is a sample database representing an online music and media store. If you want to replicate them, download and import that sample database to your server. JDBC Connection Configuration specifies the database URL, credentials, etc. 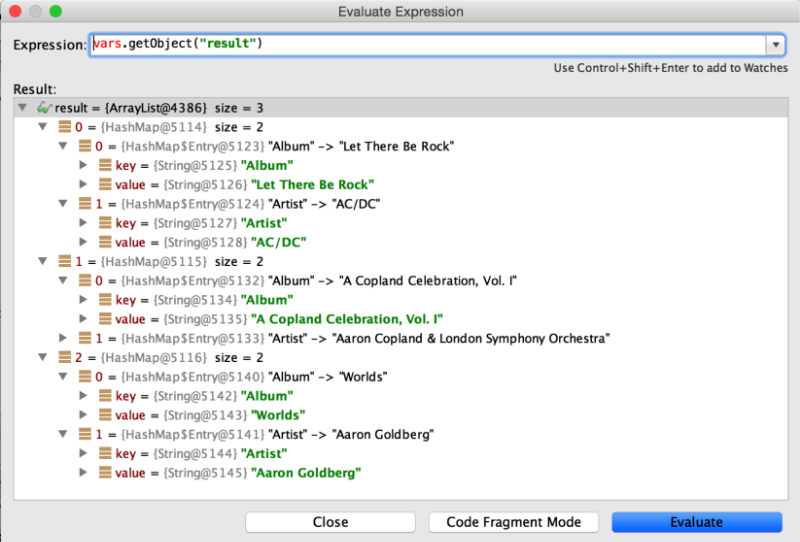 The same query executed via the JDBC Request sampler produces the same content, but the layout is not as good for interpreting the results and is very tricky to parse with regular expressions. Variable Names are presented in a list of either a single variable or comma-separated variables. If specified for SELECT statements, it holds the values from the relevant result set columns. If being used for a CALLABLE statement (invoking a stored procedure), it holds the values per OUT parameters. 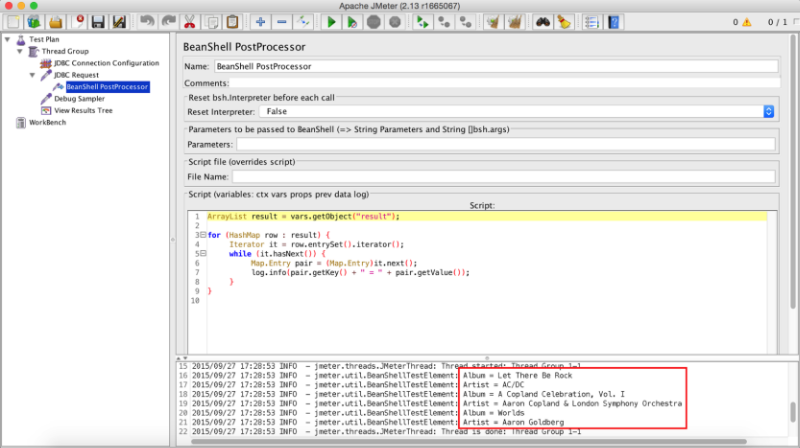 The Result Variable Name stores the result set as an ArrayList, and the values are accessible via Beanshell scripting. Regarding working with the Result Variable Name, as mentioned previously, it is an ArrayList of HashMaps, one map per result set row. The map entries count depends on the column values, the map entry name will be the same as the result set column name, and the map entry value will be the value itself. Now you should know enough to conduct an end-to-end database load test or use JDBC test elements for test parametrization. As always, if you have any questions or feedback, leave it in the comments section below. Experienced JMeter users, do you want more? You'll want to view the on-demand webcast, How to Create Advanced Load Testing Scenarios with JMeter.